In his photographic series Ganges Sand from 2008, Chinese artist Yibin Tian goes on a spiritual journey - not only to India, but to a utopian place where pureness of mind and soul is prevalent. The large-scale photographs of Ganges Sand project an inner sanctum beauty, an eternal wisdom and peace, way beyond material riches. 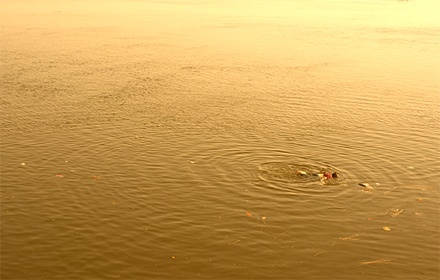 A photograph of the Ganges with debris floating in the center of the image recalls Monet's Waterlilies. The women obviously poor, but immaculately dressed in colorful saris are reminiscent of 19th Century Orientalist paintings, while a crippled hand pointing to heaven has an aura of the relics of Catholic Saints. Ganges Sand reminds us of the reasons 60's stars began searching for these spiritual riches, and that is probably why the younger generation yearns for it again today, especially as India has become one of the forefront economic powers. Hopefully it does not loose its spiritual beauty and power, which are expressed so well in Yibin Tian's images.